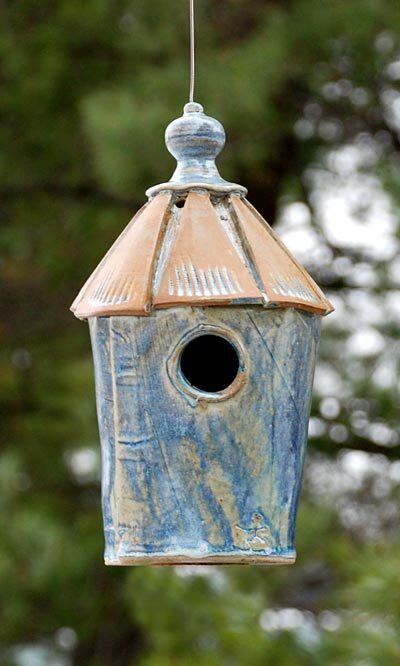 Create a charming scene in your bird garden with the Anthony Stoneware Bird Cottage Bird House. This artistic abode will surely welcome birds and visitors alike to your home. The steeply pitched roof features triangular shapes on it, with grooves in between them for a rustic look. A rounded finial tops the roof, echoing the shape of the home. Three holes in the top of the item help regulate temperatures, while three holes at the base allow any water to drain. The 1.125" diameter opening allows small birds to enter and roost, and the attached hanging cable aids in placement. The hand made ceramic construction adds individual flair, and the light blue glaze adds a rustic feel. This piece is fired to 2400° Fahrenheit, creating a durable, vitreous product that will never fade, decay, or break down after exposure to UV light. Place the Bird Cottage Bird House in your garden to welcome songbirds, year after year. Made in the USA.